Plans are underway for the 3rd annual Kingsland Wildflowers Festival on Saturday, September 22, from 12 noon to 4 pm. Fun and educational, the festival is free and offers an opportunity to learn about the rooftop garden atop our sound stage at 520 Kingsland Avenue in Greenpoint, and other conservation initiatives underway in our community. Additional activities include tours of the green roof, interactive activities for kids, live music, food, and amazing views of our beautiful city. 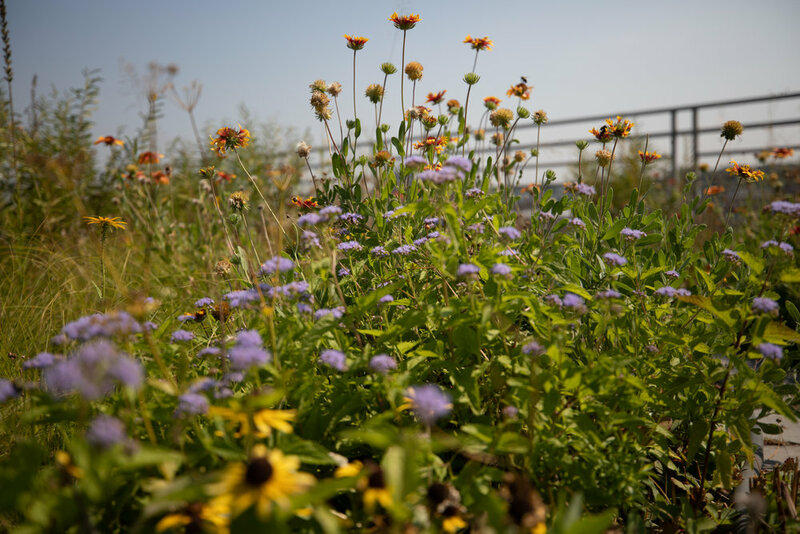 Three years ago Broadway Stages collaborated with the New York City Audubon, Alive Structures, and Newtown Creek Alliance to create the half acre green roof. Broadway Stages donated the space and, along with initial funding from the Greenpoint Community Environmental Fund, continue to provide financial support for the infrastructure and garden maintenance. The design of the garden, led by Marni Majorelle and Alive Structures, features native grasses and wildflowers designed to attract birds and other wildlife species. The NYC Audubon manages the project and oversees the wildlife monitoring through bat and bird microphones and swallow houses installed on the green roof, and is also responsible for managing the year round educational programs. For more information about greening your rooftop visit Alive Structures. For more information about the festival check out NYC Audubon or Kingsland Wildflowers.